Here’s my latest column on the delicate lines between copying and being copied, and inspiring and being inspired, written for Fine Art Views, a great resource for marketing your artwork. Enjoy! Years ago, an artist friend said something that threw me for a loop. I was just starting out as a full-time artist and craftsperson. I was open to everything. How-to books, craft magazines, patterns, you name it, I had to have it. I wanted constant inspiration and distraction, and I wanted it NOW. She said she didn’t read many books or magazines about art or craft, and didn’t go to many exhibitions or shows. Her work was highly original and personal, she said. (It was, too.) She found that if she looked “outside” at what others were doing, it distracted her, and muddied her personal vision. Her words made me rethink that practice. No, I didn’t turn the creative faucet off completely. But I learned to recognize the times where I needed to isolate myself from the rest of the pack, and simply focus on my own work. Of course, it was a LOT easier to hunker down and stay focused in those days before the internet. That faucet of ideas and inspiration has turned into a fire hose. The inspiration for my current exhibition necklace. 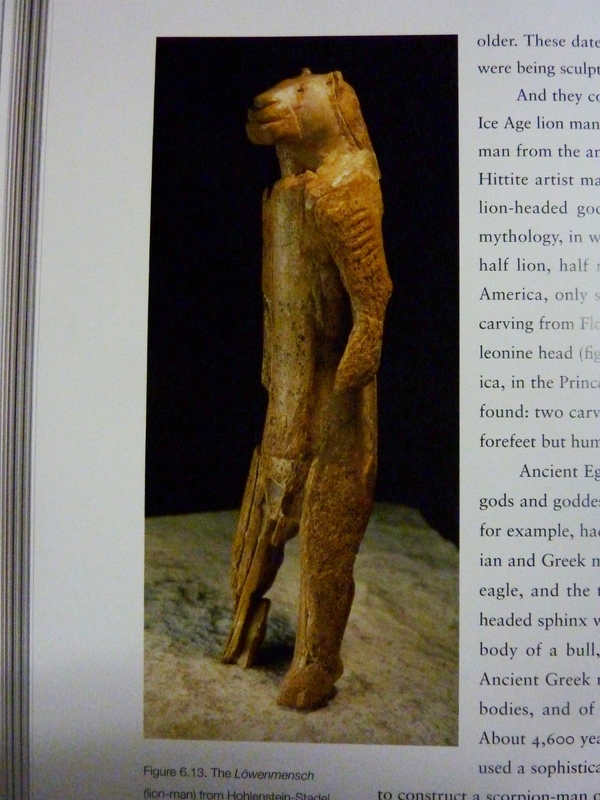 30,000 years old, no copyright issue! My intention transformed as I worked. Lion is now a bear. I just discovered an article on the International Polymer Clay Association’s website, written by Kerrie Venner, IPCA Vice President for Education and Outreach. Kerrie’s article is here. The article talked about my artwork and a blog article I wrote about my work being copied. Kerrie refers to me as an example of an artist who has published directions for making my artwork who then gets “antsy” when people copy it. 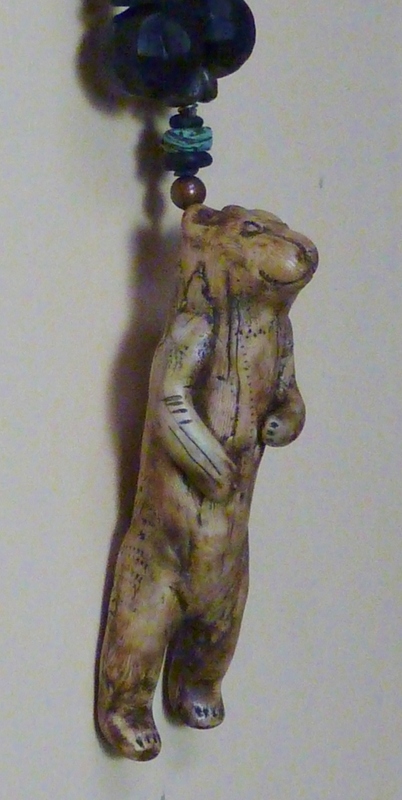 She states that she doesn’t understand what’s wrong with coveting my little totem animals, then making her own versions for her own use, and even to sell, since her customers probably aren’t familiar with my work anyway. At first I was delighted to read Kerrie’s wonderful comments about my blog and my artwork. But that delight quickly turned to dismay. Her article is an interesting take on a very complex and emotional issue. 1. Kerrie’s article simply linked to the home page of my blog. My article Kerrie that refers to in her article is WHAT IS THE STORY ONLY YOU CAN TELL? and the correct url is https://luannudell.wordpress.com/2010/05/30/what-is-the-story-only-you-can-tell/ I discuss why someone who copies another artist’s work is actually short-changing their own creative journey. 2. Contrary to Kerrie’s assertions, I’ve actually only published directions featuring my faux ivory technique (a modification of the technique originally developed by Victoria Hughes.) I provided directions for very simple beads, buttons and bones. Photographs of my animal artifacts and jewelry were for illustration and inspiration only. 3. I have never published projects or taught how to make my artifacts and animal totems, for the very reasons Kerrie mentions in support of her viewpoint: It might imply permission for others to copy my work. I’ve done the hard work to get my work out there. And I’ve spent a lot of money doing that. I’ve paid thousands of dollars to do the high-end shows to sell it. I go to great lengths to find galleries to carry it. I’ve spent thousands of hours marketing, writing, speaking, entering exhibits and juried shows, and submitting work for publication to support and grow my reputation. I’ve paid thousands of dollars to have my work professionally photographed, to construct a booth and create beautiful displays for it. I’ve spent years developing a loyal following of customers, collectors and supporters. I am deeply moved by the role my art has played in their lives. I love the stories they share with me on how much my work has meant to them, how much it has inspired them, how it has healed them. I’ve earned my stars and paid my dues. My work-and my prices–reflect that. We artists may make our art for love or money, or both. But it’s hard to make art without some kind of support from our community, be it emotional, spiritual, or financial. 1) Tell me how much it means to you, and respect the unique place in my heart it comes from. Tell your friends, too, and point them to my blog, my website or my store. 2) Spread the word about my work by writing great reviews and articles. 3) Buy it for yourself, or for a special gift. 4) If you really can’t afford my work (prices start at $42, and I have a great layaway plan), encourage potential collectors to buy it instead. Or ask friends and family to buy it for you. Christmas is coming! Actually, the list is endless: Invite me to speak to your local or regional art guild. Ask your public library to purchase the books that feature my work. Hire me for a private consult on your artist statement. Alert me to publishing opportunities. Etc., etc., etc. Unfortunately, copying my work doesn’t support me. Copying my work, then selling it as your original work, deprives me of potential customers who might buy my work. This does not support me. Telling others I am wrong to care about my work being copied does not support me. In fact, someone copying my artwork short-circuits everything I’m trying to achieve. That is where the pain and the resentment comes from. And that is what I have to get over, and get through, every time it happens. In the end, although my work is copyrighted, it’s almost impossible for me to protect those rights. I don’t have the deep pockets of Disney, and I don’t have the time or emotional energy to spare. I have to save that energy and focus for my art. Some amount of copying has its place in the learning process. That’s why a teacher provides a project for a class. But a body of work based solely on some “variation” of someone else’s work is not the work of your own heart, your own unique vision. Kerrie’s article was written without my knowledge and did not link to what I actually said. I cannot adequately convey how disheartening it is to see these views-justifying the right to copying my work simply because I have made it visible in the world–expressed by someone who is Vice President of the International Polymer Clay Association’s Education and Outreach Committee. Kerrie is entitled to her viewpoint, and I appreciate the opportunity to present mine. As she and I both said, this is a complex issue, involving human nature, the creative process and ethics. Whether or not Kerrie’s reflects the views of the IPCA organization, it was published on their site and incorrectly referred to me as an example of a disgruntled artist who sets herself up for being copied by offering her artwork as projects and classes. Since I’m not one of “those artists”–who are also entitled to their own opinions about others copying their work–and especially because I have consciously chosen not to…that allegation was neither true nor fair. I’m thrilled Kerrie loves my work. I hope someday she decides my artwork is worthy of collecting for herself. I would be truly honored. And…I would feel truly supported. It’s been brought to my attention that Kerrie didn’t mean she would actually copy my work–she was speaking aloud the thought process that many have expressed. So in a sense, she was speaking as “Everyman/Everywoman”. And she never intended these remarks to represent her, or the IPCA’s actual point-of-view. Again, I’m glad she voiced these thoughts so we can talk about it. CONCRETE ADVICE FOR HOW TO SUPPORT ARTISTS…. Sometimes–no wait, always–it’s a good idea to cool down before you speak your mind. A few weeks ago, not one, but TWO small drama played out in my studio. …It felt like someone else was publicly scolding me on a professional polymer website for me getting upset about people copying my work. Their article was written in response to MY article, What is the Story Only You Can Tell? If this is confusing, the chain of events were 1) I write the “What is the Story Only You Can Tell” article; 2) I get an emotional phone call from the victim of the identity theft issue; 3) I wrote an article about the experience; 4) Kerrie read my WITSOYCT article and publishes her response on the IPCA website; 5) I found the article and wrote my response to Kerrie’s article; 6) and now I’m publishing this article. Got it? Whew! My first emotional response was the lizard brain talkin’. Anger. Resentment. Fear. Even humiliation. And my first article draft in response showed that clearly. With brutal sarcasm and my debate team finesse, I quickly tore apart every argument offered in the article that defended copying. Fortunately, I WAS embroiled in that identity-borrowing thing. It kept me from immediately publishing my response to Kerrie’s article. The identity thing was a very prickly situation, involving a group of rowdy local activists a sane person just wants to avoid at all costs. In the end, as upset as I was, I resigned myself to damage control–and moved on. But I was delayed in writing that original response to Kerrie. And I’m soooooo glad. They may not have even deliberately chosen to “look like me”–as Katherine Tyrrell (whose Making a Mark blog is an astonishing artist resource) posted in my blog comments, it looked like a clumsy effort to use one of my blog articles to bolster their argument, and that came off as appearing like “me”. So I sat on my hands for a day or two. The anger dissipated. Cooler heads (not Bobohead Lizardbrain) prevailed. Instead of the wrathful diatribe I’d prepared, I wrote a nicer article in response to Kerrie’s article. I hope it’s nicer. I meant it to be. You can read the discussion in full here. And you can be the judge. I wanted to write a better response, because I realized, after much deep thinking about where my anger, fear and pain came from, the real issue is our current culture’s LACK OF SUPPORT for artists. DIY (Do-It-Yourself) and “I can do that!” prevail. “That’s so cool, I want to make that, too!” The internet makes it soooooo easy to do that, too. I’ve actually had visitors to my booth pressure me to tell them exactly how I make my horses, because they want to make them, too. Their attitude is I actually owe it to others to share. This a very natural, very HUMAN response to the new, the beautiful, the powerful. We want it for ourselves. We want to touch it, do it, have it. We want it to be a part of us, in any way we can. We all feel this. And throughout time, all humans have. It’s part of being human. After all, didn’t I respond to the cave of Lascaux with my own desire to make work that would resonate in the hearts of others long after I am gone? It’s what we do, and where we go with that natural, human response that’s important. Instead of “using up” the artists whose work inspires this in us…. Instead of only seeing these artists as a source of great ideas for our own amusement and use…. Instead of just viewing the work of these artists as a sort of “cosmic clip art”…. Why don’t we REWARD them for their efforts? Why not give back to them, for the joy they’ve given us? Why don’t we figure out some way to support them, whether that be financial, emotional or spiritual support? I truly appreciate the support and the good wishes of all involved. Copying is a spectrum of behaviors and decisions–some useful, some unavoidable, and some outright hurtful. I know everyone’s intentions were good, and I hope this all brings about the desired result–a CONSTRUCTIVE dialog about copying, and one that helps people make thoughtful decisions. So, taking my own words of advice, and being open to the gifts in front of us, I thank Kerrie for her honesty, for putting into words what many of us think when we justify our actions. I thank her for loving my work. And I thank her, and the International Polymer Clay Association for giving me the chance to publicly respond. I am grateful I had the chance to work through this issue, and get to the other side. The place where I should be…. …And tell the story only I can tell. 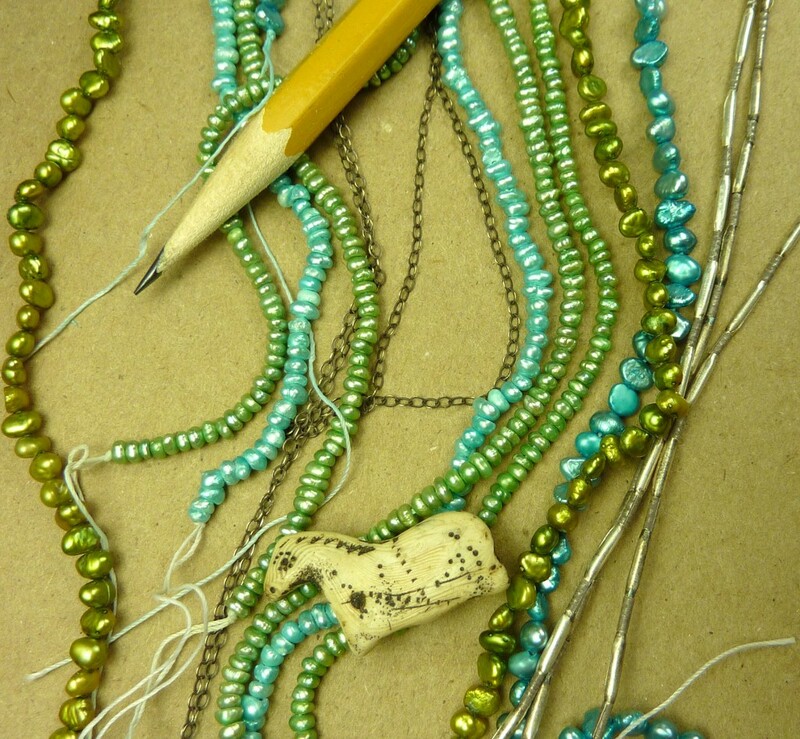 Lately I’ve been “shopping my stash” for new design ideas–going through my countless drawers of goodies (beads, findings, wire, chain) to see what inspires me. It’s a concept that’s become popular in home decorating, seeing what’s already on hand that can be repurposed/rearranged/upcycled. I have some examples today, riffs on an older design. I’m using tiny, tiny hand rolled silver beads culled from strands of Thai hill tribes silver beads. 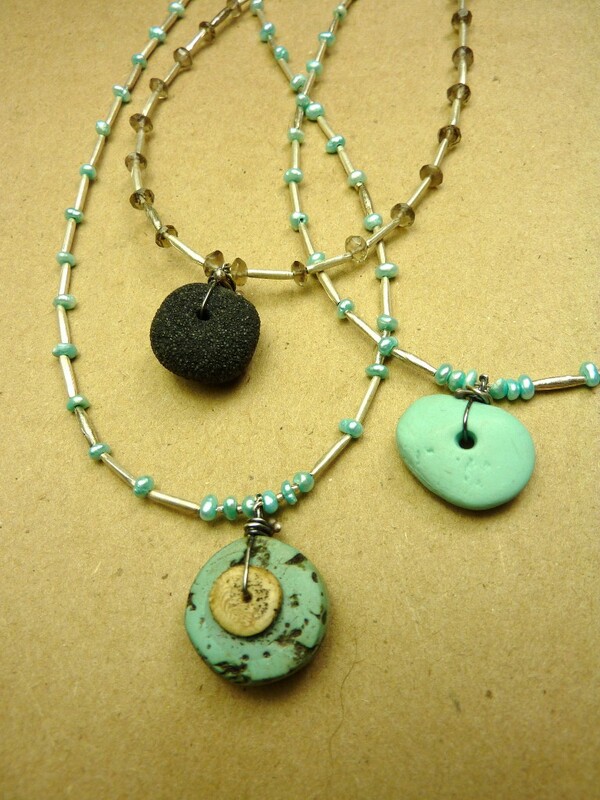 I used these a couple years ago, alternating the silver beads with turquoise chips. But this week I’m using tiny, tiny, tiny turquoise chips. And teensy tiny pearls. And very, very small faceted crystals of smokey quartz. I thought working with these 4mm pearls would be tough, til I saw these 2mm versions! Older version of silver and turquoise, newer, more delicate version above! Tiny antique red “white heart” glass beads, made in Venice and traded around the world. I love how they look with the old silver, my red “coral” artifact and my little ancient horse (with real coral). Elegant neutrals–tiny faceted smokey quartz crystals, old silver, faux lava artifacts with a tiny faux bone accent. Pretty! My thumbs hurt from picking up such tiny things, and when my eyes began to swim a few minutes ago, I decided to take a break and write instead. But it’s worth it. Because I love the extreme delicate look of these. And I especially love how the tiniest of my artifacts (stones, otters, birds, bears, horses) look with them. The weird thing is, sometimes as my brain struggles to wrap itself around this miniscule work, I can feel my thoughts narrow down, too. 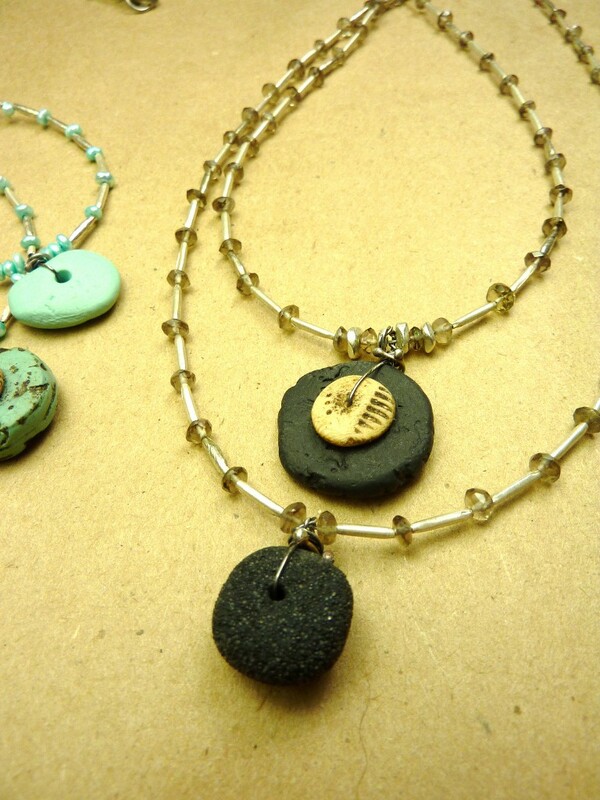 For example, this is what popped up as I made a little stone for one of these necklaces today. I realized I’ve always hesitant to show my work in “real time”–as I’m making it, etc. So much of my work has been copied over the years. A “crafter” here in NH actually “borrowed” my popular Sea Stone and Pearl designs a few years ago, to make her own line of jewelry with the same colors, identical components, even a similar-sounding name. She was on my mailing list for awhile, so she either bought some from me or visited my booth the year I introduced them. She now sells them at smaller fairs in the region. Ow. Last year, a customer came in who’d bought a piece from her and raved about her work, saying that I would really enjoy it, because “she does stones, too.” I had to bite my tongue….hard. I see some evidence she is evolving in her designs so that it’s more her own work. I console myself with the idea that I must be one of her artistic “heroes”. And pray for her to evolve faster….!!! My lizard brain wants to dwell here, nursing old hurts and grudges. But I try to let go. After all, I can’t control this. And though it’s painful, I’m trying really, really hard not to give it too much energy anymore. We are ALL inspired by others. I am. I just try to make sure that, as an idea comes to me from someone else, it gets substantially transformed into something that’s truly mine. It also happens that different artists work through different ideas from different directions, and innocently converge onto similar territory. That’s happened to me a lot, too. There are, after all, very few truly new things under the sun. Whatever. It happens. It’s time to move on. And so, in that light, there will more images in my blog from now on. Who benefits? YOU do! You get to preview my new work for the show. You get to sneak a peek at the less messy parts of my studio. Hopefully, I benefit, too. I get to spread the joy as I work. 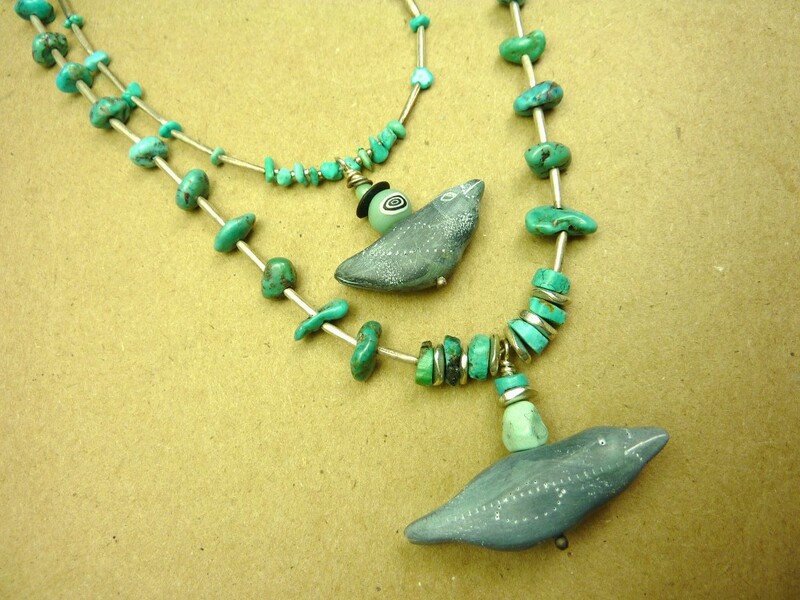 Older version of silver and turquoise with bird below, newer, more delicate version above! Elegant neutrals--tiny faceted smokey quartz crystals, old silver, faux lava artifacts with a tiny faux bone accent. Pretty! Tiny antique red white heart glass beads, made in Venice and traded around the world. 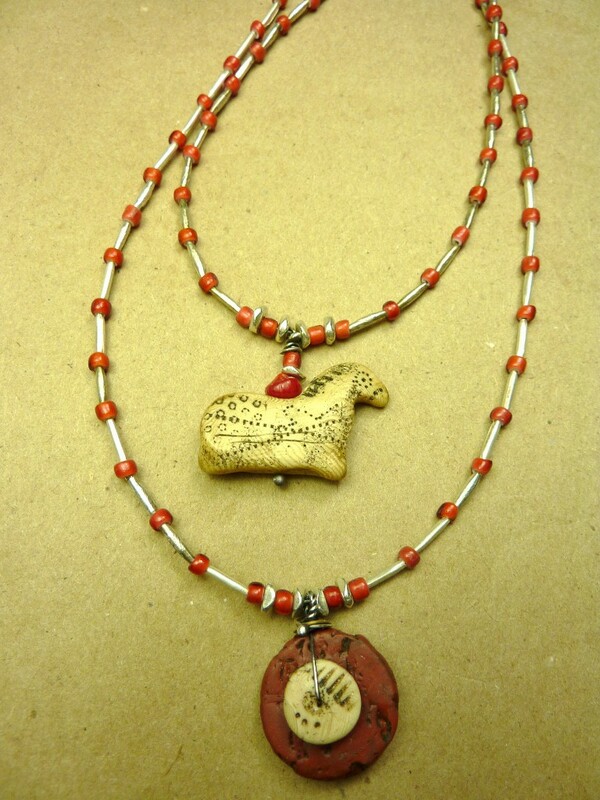 I love how they look with the old silver, my red faux coral artifact and my little ancient horse (with real coral). I’m often asked to speak about my art. I’m good at it, too. It’s been a long journey, but I’ve become extremely comfortable sharing what is in my heart. There is one frustration I sometimes encounter, though. Or the people that don’t even ask. They just start making cave ponies. It’s not that they took my idea. It’s that they got the wrong idea. I know I don’t own the idea of horses, the Lascaux horse, or even ancient images. It would be preposterous of me to say no one else can use these images. I DO own my story. And if you’ve ever listened to, or read my stories, and really heard them, you know I’m not just making little plastic horses. Her take was different. Deeper. More sensitive. Profound. And when she spoke, I felt that ring of truth, that recognition of passion, that little shiver that goes down your spine when you hear deep knowledge expressed by someone from their heart. It was her story. And it was astonishing. If you know my story, you know my little horses represent many things to me–a childhood desire to run free, to fly, to feel the wind blowing my hair as my horse and I course across a plain together. You know it’s about the beauty of horses, the thrill of watching an animal born to run, run with all their heart. Doing what they were meant to do. Being what they were meant to be. But they also represent choices. The choice to be the person you were meant to be. The choice to overcome fear, self-doubt and the weight of adulthood, and try something you’ve always dreamed of doing. To step into yourself, to take up your dreams, and live them. To follow the call. And the choice to create beauty and embrace hope in the face of despair. It boggles the mind to think that someone can hear my story. And then copy my work. Not just because my work is so personal and so important to me. But because they missed the whole damn point of the story! It’s that in YOU, is a story that only YOU can tell. Because it is YOUR story. It happened to YOU. And it changed you–how you look at life, how you look at yourself, where you fit into the world. Your story creates a place where, when you stand there, you are powerful. And you are beautiful, and you are whole. How…..can anyone want to ignore their own powerful, wonderful, incredible story? And try to substitute someone else’s?? Even when your story is not about something you do, or something you make, it is still a place that YOU came to, a crossroads, YOU found yourself at, a journey YOU find yourself on. Example: Anyone can do hospice work. It doesn’t take a “special person”. It just takes someone willing to be there. Anyone could do what I do. But only I can tell the stories that come to me by doing it. I know a woman who translates for the rights of an indigenous people in Brazil. She has even spoken at the United Nations. She insists she does not speak FOR them–they speak THROUGH her. She is their pipeline to a world that needs to honor their cries for help. But the stories she tells about how they found her are incredible, and powerful. That is why envy, and jealousy, are so destructive to creative people. To ANY of us. Because it means we cannot see the power of our own stories. What is the story that only YOU can tell? And how will you tell it today? Author Luann UdellPosted on May 30, 2010 February 13, 2013 Categories 9/11, art, artist statement, choices, copycats, craft, creativity, envy, hospice, inspiration, jealousy, lessons from hospice, telling your story, What is the story only you can tell?Tags 9/11, art, artist statement, copycat, craft, creativity, inspiration, lessons from hospice, telling your story32 Comments on WHAT IS THE STORY ONLY YOU CAN TELL? It’s ultimately better (for YOU) to get out there and make MORE art than to protect what you’ve got. An artist on a crafts forum posted about someone finding a protected image file on her website. The person had left a cryptic message on her guest book: “Thanks”. The artist is in a panic about possible copyright infringement. Will her design be stolen? Manufactured in China? Sold in Target stores across the U.S.?? But it also brought me back to the times I thought someone was stealing my designs. And what kind of energy that built in me. I know the potential for someone lifting your images is real. On the other hand, you’ve really worked yourself up over one word someone posted to your guest book. I do not mean to disrespect your fears or feelings here–we ALL do this! And this incident may indeed be legitimate grounds for concern. Try not to let anxiety and fear drive all your business decisions. Your best defense against having a design stolen is what’s actually good for you as an artist as well: Keep moving! Keep developing more work, keep your ideas coming, keep your work fresh. I’ve been there. I’ve found myself in situations where I felt paralyzed, fearful an action would put me in the way of being copied or my designs ripped off. But when I look back, I realize that all the energy I thought I had to devote to protecting myself, would have better spent simply getting my work out there and making a heckuva lot more of it. I’m NOT saying roll over and play dead. Sometimes all that’s needed is a cease-and-desist letter from you or your family lawyer to put a little fear into the heart of your copycat. I’m saying that the energy you put into controlling this possibility could be better spent on your artwork. In fact, if you “shut down” and try to control all access to your images, and focus on protecting yourself, you will be working against yourself. In fact, your best defense is to get your work established, recognizable, and GOOD. True, that alone may not get you $$ from the design infringement. But it goes a long way to getting the infringement STOPPED. We only have so much time, energy and money to spend on the things that are important to us. We read in the news about people who win big lawsuits and huge settlements. It’s easy to think that could be us. In reality, those “windfalls” involve time, angst, lots of lawyers, and yes, more money. When people say, “Nobody gets rich but the lawyers”, believe them. In the end, even if you COULD get rich and famous from defending a design, is that what you want? Or do you want to get rich and famous by getting your work out into the world and seen and enjoyed and bought by as many people as possible?